At a quick glance, the phone’s front may resemble the iPhone 4. 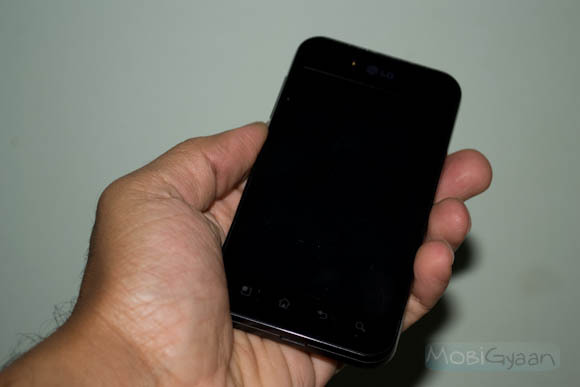 The LG Optimus Black is obviously available in Black color. Other available colors are Pink, Silver, White, Brown. This makes me wonder why its called the ‘Black’. The front has the 4 android menu buttons. They are capacitive and their tactile feedback and visual color change on touch is very intuitive. The 4 inch screen is a IPS LCD capacitive display. This technology is marketed by the brand name NOVA. The Nova display is utterly brilliant only next to iPhone’s Retina display. It got good sunlight visibility and at indoors its sheer brilliance conquers you the moment you turn it on. The display is protected by a scratch resistant Gorilla glass. Its resolution is 480 x 800 which is much needed for browsing and playing HD games. The top of the front face has the sensors and the front 2MP camera. The head speaker inset on top is almost invisible. At the top, you have the 3.5mm audio jack, micro usb port for charging and data transfer. This USB port is covered by a neatly designed slider, but I feel that this is unnecessary. 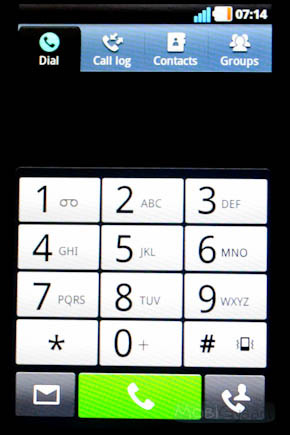 The power off / lock button is at the top too and its easily accessible using your fingers. The right side is totally plain. A dedicated camera button would have been good. The left side has the volume rocker and the gesture key. We will talk about the gesture key later. The back of phone is pretty plain. Matte finish battery cover gives a better grip. 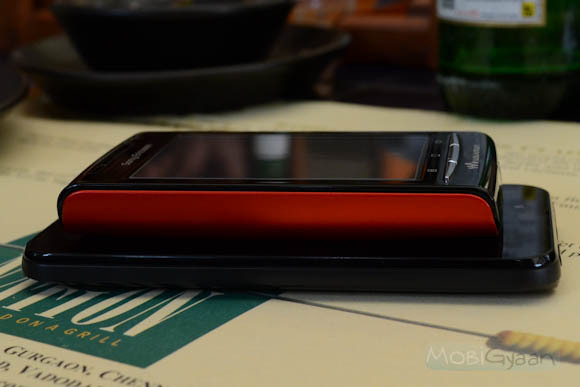 It has the 5 MP camera with LED flash and the speakers. The location of the speakers is a minor flaw. When you keep the phone on a bed or sofa with face up, the speaker is totally muffled and you may not hear the incoming ring. 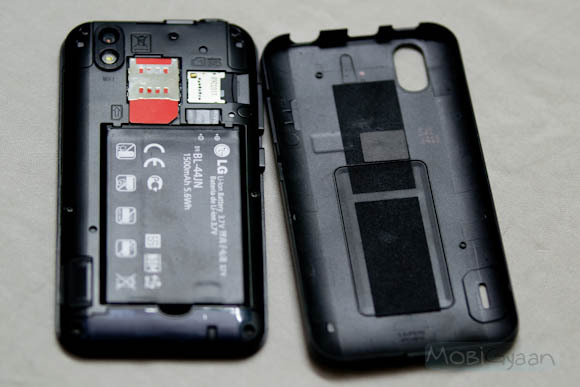 The phone’s overall design feels quite solid, but once you remove the battery cover, it feels soft of weak and cheap. 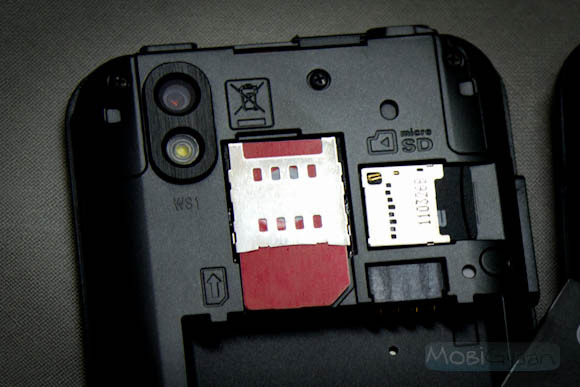 Under the cover you see the Lithium ion 1500 mAh battery, SIM slot and hot swappable micro SD card slot. A 2GB card is bundled with the package. The handset is powered by 1 GHz Cortex-A8 processor with PowerVR SGX530 GPU and it has TI OMAP 3630 chipset. 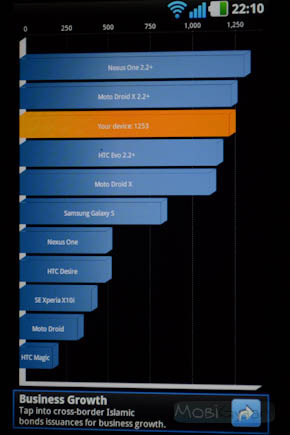 The processor is quite powerful and contributes to the device’s responsiveness. The power of the GPU is when while watching HD movies and playing HD games. This device is a shear piece of entertainment. But the battery is insufficient. LG assures 6 hours talk time, but with always-on data connectivity and prolonged usage the charges drains out in even less than 6-10 hours. The highlight of this device is its Nova display. Nova is a brand name given for IPS screen display technology used in Optimus Black. The quality of the display output is exemplary and it comes very close to Apple’s retina display. 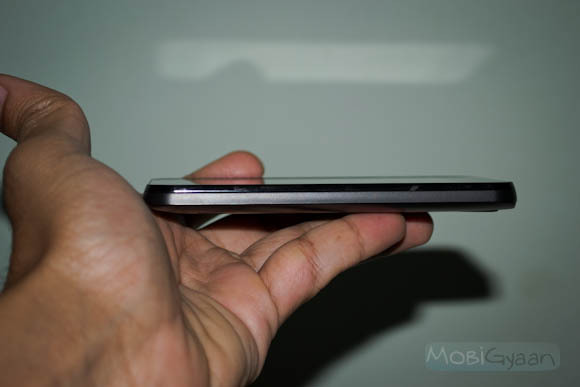 Nova has also contributed to the overall thinness of the device. The viewing angles are better and sunlight legibility is clearer when the brighness is increased. The screen’s touch responsiveness is smooth. But when tapping to open certain application there is a noted amount of delay and repeated tapping is required in a few instances. 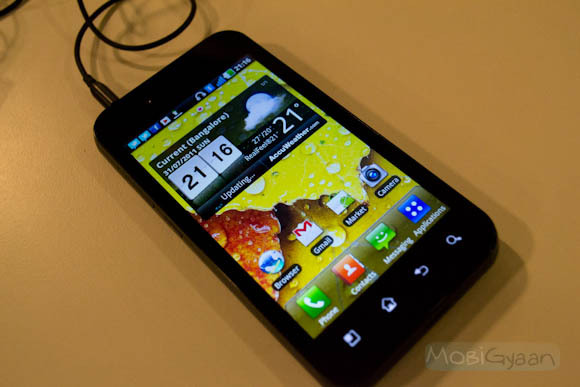 LG Optimus Black has a primary 5 megapixel aut-focus camera capable of capturing 2592 x 1944 resolution images, supported by a LED flash. The camera interface is very user friendly. But the options and settings are a bit hidden under 2 levels of navigation, which may take a while to figure out and get used to. Even to zoom you need to navigate two steps down. But it offers a variety of advanced shooting modes and post processing effects. It also includes a panoramic shooting mode, which shoots in VGA mode and the fastest post processing for a panoramic pictures. Among all the other controls, ISO sensitivity control was a huge surprise. The regular image quality is pretty decent. The edges are a bit softened. But the color contrast and detailing is good. 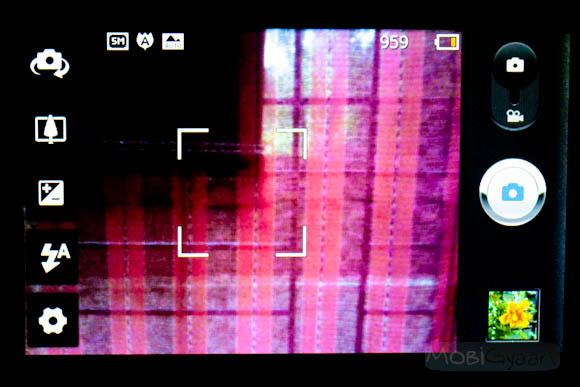 Its a decent 5 mega pixel camera and among the best ones available in Android mobiles which I have tested so far. The single LED flash is very effective and it gave out some pretty decent images in totally dark environments. Check out the sample images here. 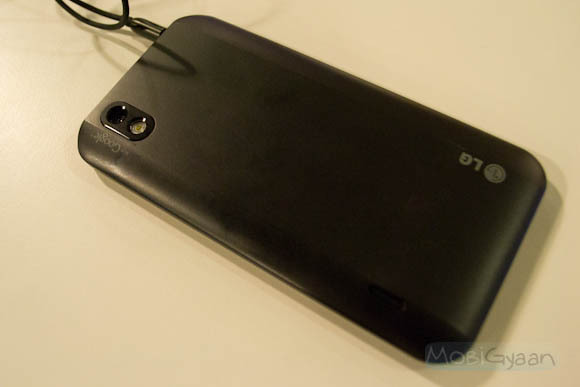 The LG Optimus black is capable of HD video recording at 720p. 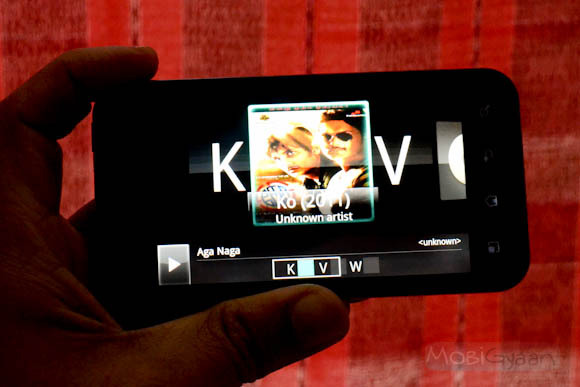 Switching between camera and video mode is straight forward like in any other Android system. The interface is similar to the camera interface. Video recording quality was matching the expectations. The output is in .3gp format. Strangely when I play the captured HD videos in computer, the aspect ratio looked stretched. It looks fine on and smooth on the phone though. The video recorder too had some post processing effects built-in. Black is not an exquisitevely brilliant camera phone, but its suitable for those occasional moment captures and it does its job well. Black has a sweet little feature called the Gesture key. The Gesture or the G key is located below the volume rocker. When pressed, the phone’s accelerometer becomes intelligent and starts controlling the mapping of the screen layout. For instance, when pressed and waved, the homescreen starts switching to the next one by the wave of your hand. The G key promises a lot of features like picking up calls, invoking camera, navigating image gallery, etc. But I never figured out how to use these gestures. Zooming and moving around a image file was rather a fun thing to do with gestures. But this feature doesn’t contribute to better user experience hence a marketing gimmick. Out of the box, Black comes with a in-ear wired headset which can be used for phone calls, music and FM radio. The quality of the headset is satisfactory for a OEM pair of headsets. The rubber tips comfortably fit in the ears. The Media player has a straight forward interface. On the landscape mode the album art is tiled in 3D space and sorted alphabetically. The video player is also minimalistic. Playing a HD video on the device was a pleasure to watch. The quality was crisp and extremely detailed. The bright NOVA display contributes directly to this brilliance. The device also supports DivX and XviD formats out of the box. FM radio interface was also user friendly and it lacked the frills and fancies. 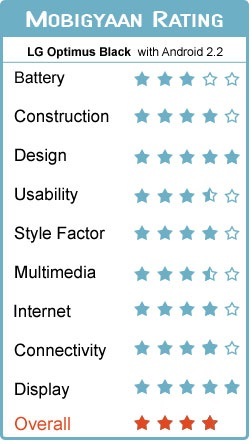 When these stock applications serve the purpose and don’t complicate the user experience, we have nothing to complain. 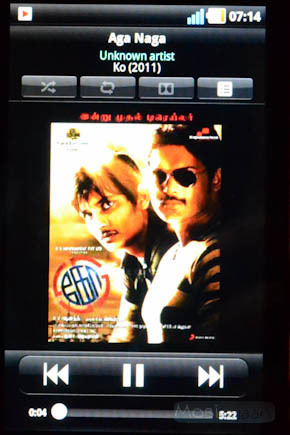 The Optimus UI 1.0 sits on top of the Android 2.2 UI. Optimus UI is changes are very subtle as compared to Sense or Blur. For some users who expect high quality UI, it may be a disappointment, but for most users who want the best out of the UI, the Optimus UI serves the purpose. The font used is really crisp and visually appealing. Reading messages or text in browser is a pleasure. Native applications UI have been customized by the Optimus UI. 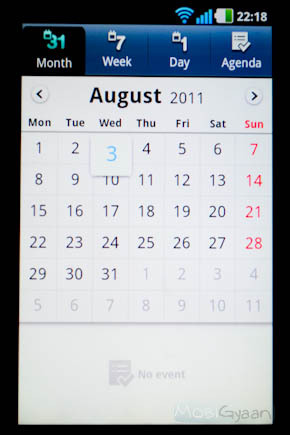 The boring vanilla android calendar and messaging applications have been made interesting and intuitive. Optimus Black comes with a set of pre-installed applications. Its good to have these applications, but there is no room to remove them unless rooted. The main menu has been customized and there are 3 different layout options to choose from. Grid view with side scroll, grid view with vertical scroll and categorical view are the 3 layout options. Along with the regular controls, the notification area also has the music menu to control. 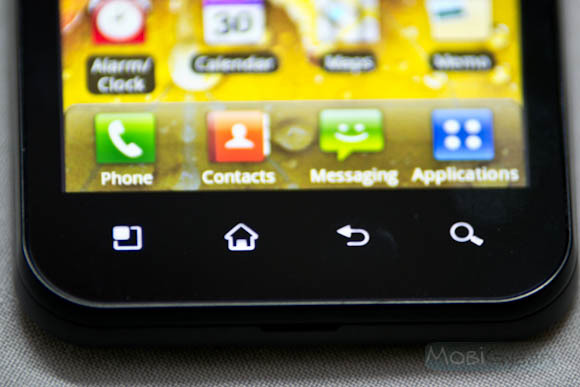 Browsing the internet with LG Optimus Black was a pleasure. The wide screen and out of the box Flash support are its biggest advantage. Scrolling through the pages was smooth and also the gestures G button was very helpful. For its single core processor, this mobile exceeds expectation on Internet browsing experience. I didn’t try out the 3G connectivity, but at the regular 2G connection, the speed was quite sufficient. 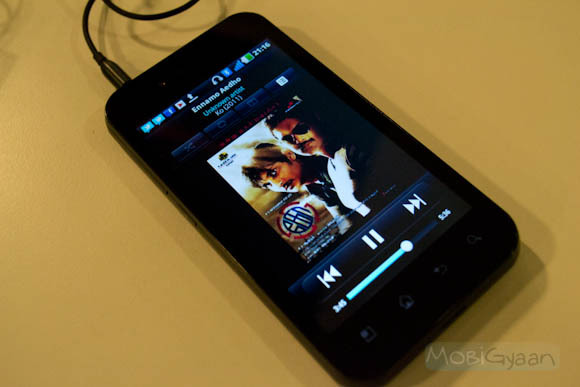 The mobile is capable of reaching 7.2 Mbps HSDPA and 5.76 Mbps HSUPA speed on a 3G network. However I extensively used the built-in 802.11 b/g/n Wi-Fi radio for most of my testing. Connecting to any Wi-Fi network was almost instant and when the mobile is idle, the wi-fi connectivity automatically gets disabled, saving a lot of battery. Optimus Black has Wi-Fi Direct connectivity which enables it to connect with a maximum of 8 devices simultaneously. A neat little feature called Smart-Share allows other devices to browse Black’s media content when connected over a Wi-Fi direct network. Optimus Black as A-GPS and it took an average of 1.41 minutes to lock wi-fi connection after the device is just switched on. But after that, everytime the Maps of any GPS requesting application is launched, the lock is obtained in 3-4 seconds tops. The dialer and contact application has been slightly modified from the vanilla Android version. Apart from the visual change and reorganized visual components, nothing much has been changed to enhance the user experience. I have found that the basic dialer and contact application in native Android is good, but not good enough. So I use Dialler one as the replacement. 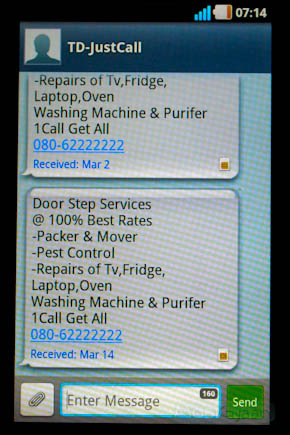 LG’s dialler app missed the intuitive interaction that any 3rd party dialler would have given. The call quality was good enough. Black promises noise cancellation, but this feature was not that obvious. The incoming voice is barely audible (on full volume) on a noisy environment, but the receiver could hear my voice clearly along with some external noise. The speaker phone is quite powerful and I found that the noise cancelling works best in the speaker mode. But again, you have make sure that the speaker slot is not blocked. 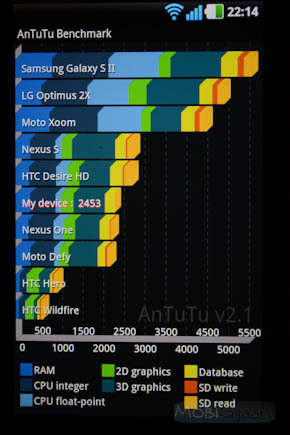 Among all the single core 1GHz android devices, Optimus black stood on top on most for the test results. The graphics support was really good and the frame rate it delivered in the tests were around 33 fps, which is really good in the current market trend. 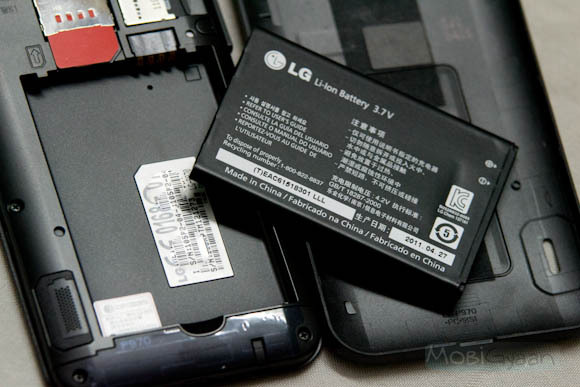 But ultimately the high performance is eating into the battery life of the device.